How do we stay healthy as we age? Numerous studies suggest getting a cat! Cats and older adults can be the perfect match, especially when you know ways to keep your daily cat care chores simple. Here are some tips for making it easier for cats and older adults to live together. But first, let’s look at the ways cats can improve our health. Cats reduce the risk of heart attack. The University of Minnesota’s Stroke Research Center followed 4,435 people between the ages of 30-75. Over a 20-year period, they found that participants who had never owned a cat were 40 percent more likely to die from a heart attack and 30 percent more likely to die from any kind of cardiovascular disease. Cats can lower blood pressure and cholesterol. Researchers measured the blood pressure, plasma cholesterol and triglyceride values in 5741 people who attended a free screening clinic at the Baker Medical Research Institute in Melbourne, Australia. People with companion animals had significantly lower systolic blood pressure and plasma triglycerides than people who didn’t, although their lifestyles, including smoking and diet, were similar. Cats relieve loneliness and can give a person who lives alone a feeling of purpose. Even when the humans in our lives have other things to do, our cats depend on us for companionship and love. Cats keep us moving. We need to feed them and scoop those boxes, no matter how lazy we’re feeling. 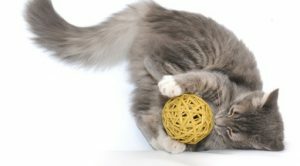 Playing and brushing are also active pursuits that both cats and older adults enjoy. Cats add some routine and structure to our days, and that’s important for people who live alone. Our cats never let us forget when it’s breakfast and dinnertime! Cats make us laugh, and sometimes laughter is the best medicine. Cats may be self-sufficient, but they still require some daily maintenance. 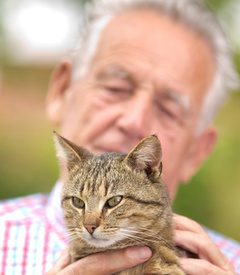 Here are some ways to make cat care easier for older adults. Simpler Scooping : If bending over is difficult, try a scoop with a long handle . Or elevate the litter box so you don’t have to bend over so far. Just make sure the cat can get to it easily! Use a box without a top. Your cat will prefer it, and not having to remove a top will be one less thing you’ll have to do. While electronic litter boxes can make it unnecessary to scoop every day, they tend to be glitchy and are often more trouble than they’re worth. Quicker Cleaning: Use a good litter box mat that’s comfortable underfoot for your cat and actually traps scattered litter. And think about replacing the dustpan and brush with a cordless, bagless stick vacuum. Most are light, easy to push around and are great for picking up cat hair and scattered litter. Less Lifting: Think about ordering your cat food and litter online, and let the UPS driver do the heavy lifting. While shipping can be expensive, many websites offer free shipping on orders of $50 or even less. Easy Feeding: There’s no rule that says cats have to eat on the floor. If bending over is difficult, give your cat a tiny section of the kitchen counter for her food and water, or put her bowls on a table where they’re easy for you to reach. Brush often: Brushing your cat daily or using a greyhound comb will minimize shedding and accumulating cat hair on your furniture and rugs. And you and your cat will both enjoy the grooming sessions. Visiting The Vet: Soft-sided carriers are lighter than the plastic ones and are easier to carry when you have to take your cat to the vet. Or use a house call vet if there’s one in your area. And remember, your cat does not need to be vaccinated every year. If your cat doesn’t go out, she doesn’t need to be vaccinated at all after she’s had her kitten shots. Managing Medicine: Most medications can be compounded into medicated treats or a gel that you’d rub inside the cat’s ear tip. And many compounding pharmacies can put the gel into twist-a-dose applicators, so you don’t have to measure the amount. Set reminders on your cell phone or alarm clock, if you’re afraid you’ll forget to give your cat her medicine. Put it on your calendar or a chart, too, and check off each day right after you give the medicine. Many of the medications cats take are really human drugs, and if you and your cat are both hyperthyroid or have heart disease, your medications might have the same names. To avoid confusion, put her medicine and yours in pill boxes that are different colors and label them so you’re confident both of you are getting the rights meds in the right dose. Here’s more information on medicating cats. Ask For Help: If caring for your cat becomes too difficult, don’t assume you have to part with your feline friend. Purchase some self-feeders , and ask a rescue group for volunteers to feed and scoop a few days a week. Many pet sitters, too, offer this service. Or a neighbor might be willing to help. If you feel it’s time to move into a retirement community, it’s possible to find one that allows residents to bring their animal companions. Many assisted living facilities do, too. Studies show that people who live with animal companions tend to exercise and socialize more. The studies usually refer to dogs, but the same can be true of cats. Playing with your cat with a fishing pole or wand toy is a great way for the two of you to get some exercise. And think about going outside together. If you sit outside with your cat, chances are she’ll stay right with you. Or take her out on a harness and leash. A kitty stroller is another great way for you to get some exercise and socialize with your neighbors while enjoying the company of your cat. Most are light and easy to push and some are relatively inexpensive. Cats and older adults can be a perfect match. And with some thought and planning, cat care can be easy and won’t feel like such a challenge.